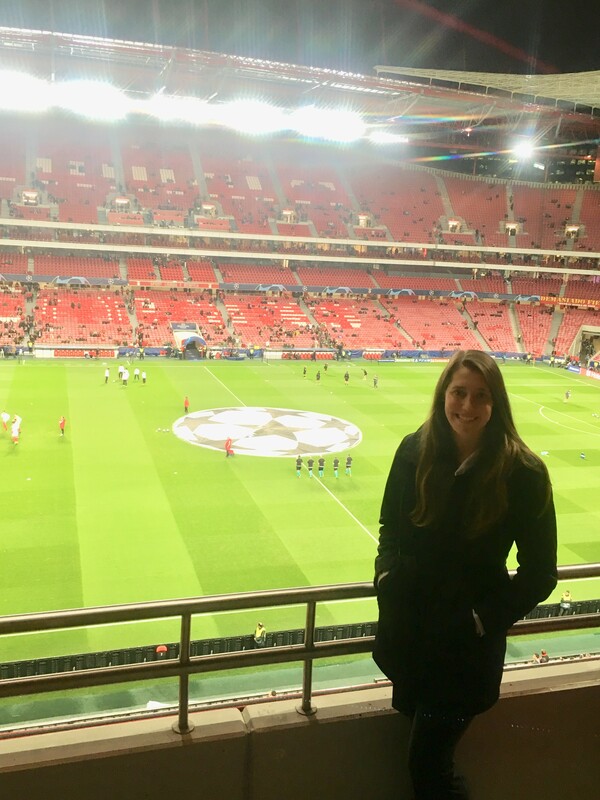 In December, FC Wisconsin Pre-ECNL and Goalkeeping Director Monica Gonyo traveled to Lisbon, Portugal for an incredible coaching education and development trip as part of the ECNL International Coaching Program. The Program had two different components, and began with 3 days of presentations and observation at Benfica, one of Portugal’s most iconic clubs and recent winner of the Youth Academy of the Year award in Europe. Following the Benfica visit, the second component of the course was 3 days of work with world-renowned educator Raymond Verheijen, the founder of World Football Academy and a coach in 4 different Men’s World Cups. After returning from the trip, and having time to reflect on the experience, Monica shared her thoughts on development, education, and what she learned from this unique experience. What an amazing place to have the International Coaching Trip! Lisbon, Portugal, is home to city rivals Sporting CP and SL Benfica, two of the top 3 teams in this beautiful country. A city divided by their teams yet united by football. This notion became clear upon my arrival in Lisbon while talking to my cab driver on my way to our hotel. The second I mentioned that I was in town for football, the driver lit up and went on and on about his beloved team, Benfica. He grew up near Caixa Futebol Campus, the main grounds where Benfica’s teams train and some of the players and staff in the club live. This was also the place where I would spend the majority of the next few days, observing a few presentations and a number of training sessions. The first several days of the trip was led by SL Benfica staff who presented on their youth development model and game model. These presentations provided significant insight into how Benfica develops young players into high quality players and prepares the best to play in a high performing environment as professionals. Their offensive style of play and willingness to recover and defend is consistent from their young players all the way to their professional team. These things are just some of the reasons why Benfica has had such a successful past and promising future. What I valued most about the club was how they strive to develop the entire being as both a player and a person. They push to be the best and want to win every game they play. However, they recognize that if the players are always winning, the games are most likely not very competitive. Competitive games provide the players opportunities to be challenged and improve. They not only show these players what success feels like when they win, but also, what defeat feels like when they lose. The player and the individual should learn that everything in life is not easy, and long-term success takes hard work and preparation. I also found it interesting that many of the assistant coaches at Benfica are former players of the club. The fact that these players came back to the club says so much about the culture of the club and the positive impact that it had on their lives. It reminds me about why I wanted to come back to FC Wisconsin as a coach after my career as a player. I have been where the girls I coach have been, and I can relate to them as players. I think about how the sport and this club has made me the player and person I am today, and how much I enjoyed playing, and now coaching, in a competitive environment. We also had the opportunity to observe some of Benfica’s training sessions. From simple 1v1 activities at the youngest ages to full-sided games in their U19 trainings, every player looked comfortable on the ball and every activity was competitive in its own way. Their winning culture and team unity showed in every session. When a goal needed to be moved for their next activity, all 25 players on their U19 team helped carry the goal to where it needed to be placed. After the activity, the losing team was instructed to put the goal back. An atmosphere where players are connected and compete pushes every player to get better. As a coach, it is our job to raise the bar for our players. The environment we want to create starts with us as a coach. If we allow players to make mistakes without correcting them, our players will never improve. If we allow a player to play at a low intensity and go through the motions, they will never uncover their true potential. The more we put ourselves in uncomfortable situations, the more we will grow, as both a person and a coach. The same goes for our players. Challenge them, put them under pressure, let them make decisions on their own. Sometimes they will make poor decisions, and you will be there to help and coach them through it, but other times they will succeed and it will surprise you. Eventually, they will make better decisions and will make them faster and more often because they have been in that situation numerous times before. When our players are playing well, there is no need to interrupt. Sit back and let them play. The less they think about, the better. The more a conscious thought can become an unconscious behavior, the better the player will be. Players should focus on improving one thing until they can do it correctly and consistently. While this may take some time, it will allow the players to improve that one thing, without being overwhelmed. The amount of information I learned on my trip is invaluable in my development as a coach. Thank you to the ECNL for awarding me with the 2018 H.E.R. Coaching Scholarship and to my club for allowing me to attend. I am grateful for this unbelievable experience and am excited to take what I learned and apply it in my own coaching to help develop the players at FC WI.